The plight of Chicago rappers continues. 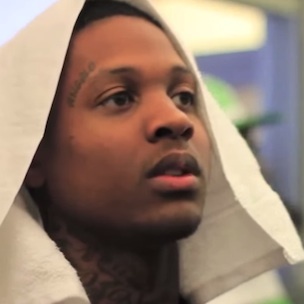 Lil’ Durk has reportedly been arrested and charged with unlawful use of a weapon by a felon. According to reports, police were responding to a homicide and went to a home in the Orland Hills section of Chicago and found the 22-year-old rapper standing near a kitchen island where two guns were sitting in plain sight. A Glock .45-caliber handgun and a Springfield .45-caliber handgun were seized. Durk will appear in bond court on Thursday, Nov. 6th. This isn’t the Def Jam signee’s first run-in with the law. He pleaded guilty to gun possession charges in August.